As the Dowager Countess innocently inquired “What is a ‘week-end’?” on Downton Abbey, I too have experienced my days merging together into one blur. However, I haven’t been idly sipping tea and sacking servants, rather I am so immersed in the routine of feeding-burping-changing-bouncing Clara, that most days feel the same. We’ve passed that six-week milestone together, Clara and I. She is more alert and smiling sweetly, stealing my heart every time her little mouth turns up at the corners. I have so enjoyed the early days, but truth be told, I’ve missed blogging, and I can’t wait to get back into developing recipes and sharing them with you. I have to extend a big “thank you” to the guest bloggers who helped fill my shoes while I took some time off. Annie, Kelsey, Andrew, Jan, Katie, and Jessica – thank you for sharing your expertise with my readers! You’ve enriched this space and lent a different perspective on everything from freezer cooking and finicky eaters, to fresh mozzarella and feeding tweens. So, thank you! Now let’s talk about spinach. It’s one of the earliest spring vegetables, and as my son loves to remind me, is a super food. That alone is reason enough to make this pasta for dinner tonight. Even in the frigid Yukon Territories where I grew up, spinach was the first of our crops to bravely raise its dark green leaves above the soil in the spring. They were a welcome sight after a long winter, and those delicate spinach salads we tossed together were a promise of the bounty we were to enjoy in the coming months while the rest of the garden greens caught up to the front-running spinach. Aside from being an early bird, spinach is incredibly easy to grow. You can literally throw the seeds in the ground as early as mid-April (that’s now!) and enjoy baby spinach by Mother’s Day. Spinach is popular in my kitchen because it can be enjoyed both raw and cooked, and its mild flavor makes it an easy sell to my children, especially since they know it is a super food! Both prep and cooking time is short for spinach, making it an easy accompaniment to many dishes such as soups, sandwiches and pastas, like the one below. This simple pasta recipe is typical of how were eating now – easy, one-pot meals that can be adapted to selective palates (see variations below), and that make terrific leftovers. If I can, I do some dinner prep in the afternoon, but more often than not, my window to cook the evening meal is only open for about 15 minutes. The instant Danny steps in the door, I hand the baby off to him and attack the kitchen, preparing a meal that can be stirred together and on the table in a jiffy. This fast and easy vegetarian dinner showcases fresh spinach, and creamy ricotta brings it all together. Melt butter in a large frying pan and add shallots. Cook over medium-low heat, stirring occasionally, for 3-4 minutes or until shallots are soft. Add all the spinach to the pan, salt lightly, and cover with a lid for 2-3 minutes. Meanwhile, boil pasta in salted water for 8-9 minutes or recommended cooking time. In a large serving bowl, whisk together egg and ricotta. Set aside. Using a pair of cooking tongs, turn spinach in the pan until it is wilted, but not completely cooked. Remove from heat. Drain pasta and add to ricotta mixture. Toss well to coat. Add spinach to the pasta and combine well. Season with salt and freshly ground pepper as needed and serve at once. 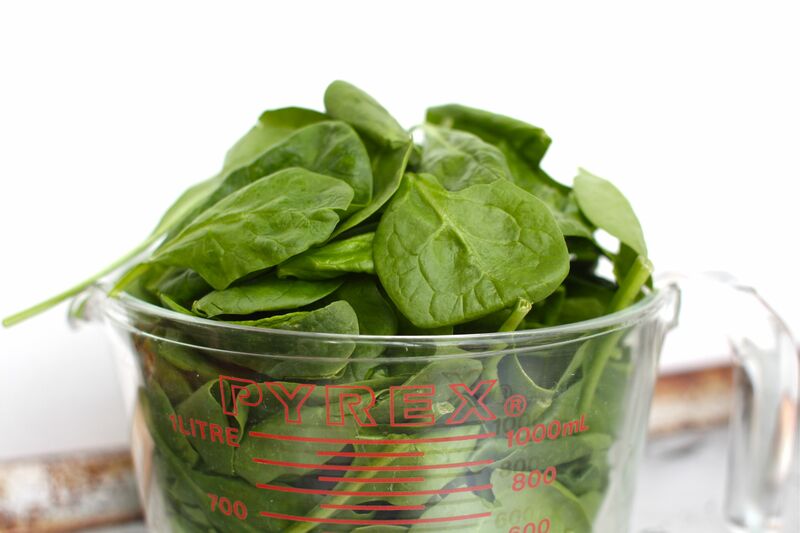 What is your favorite way to serve up spinach? I’m totally making this for dinner this week! Love this! I love spinach. We add it to smoothies, make homemade dressing and have a great salad and use it to make pesto. Your pasta dish looks so delicious! I also like to squeeze in extra spinach in Green Monster smoothies. You can’t even taste it unless you add a LOT and even then, it’s not a bad thing:-). Welcome back! For some strange reason, spinach has always been the vegetable that my kids like the most (hooray! ), so we add it to everything! It doesn’t require a lot of prep on my end, and the two factors combined make it a perfect food for our family. We add it to soups, pastas, tacos, burritos, and always put it on pizza. I’ve made this dish with white beans as the protein, but the ricotta cheese might be a nice change. Thanks for the recipe. Lovely recipe!! I will be making one of my favorite spinach recipes tonight–spanokopita. Perfect simple and quick dinner! I often add spinach to my red sauce to serve with hot pasta. And I am also fan of green smoothies. My son likes me to put strawberries in his smoothies, and I agree that spinach + strawberries is a lovely combination –in a salad too. My Fall spinach did not come up well so I left it to overwinter. Lo and behold, the warmish winter weather resulted in beautiful spinach for the early Spring! It would take a while to amass 5 cups of baby spinach, but I think this recipe would be worth it! What a great recipe to have on hand when vegetarian guests come to visit! Who did the Dowager Countess sack?? My favorite use of spinach is simply sauteed as a side to liver and mac/cheese. For whatever reason, that trio is one of my favorite comfort combos. This week we’re making spinach quiche! My two-year-old loves spinach and will eat it in anyway: raw in a salad, stir-fried, in a casserole. He just had green spinach tortillas this weekend haha. We;ve been rocking the easy pasta dinners here lately, and I love spinach in mine. 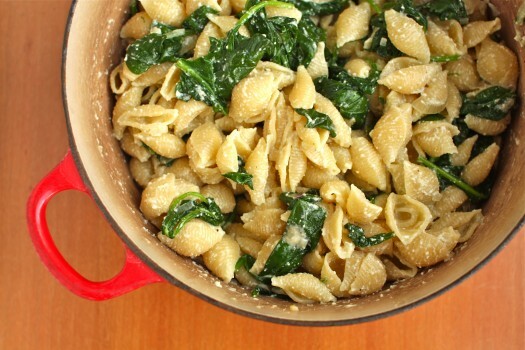 I can just taste how creamy and perfect this is with the sweet, earthy spinach. Probably one of our favorite ways to enjoy spinach is simply sauteed in a little olive oil with kosher salt, and then drizzled with balsamic vinegar. Yum! Sounds wonderful! Will definitely put this on the menu as soon as I see fresh spinach coming our way…right now we are “enjoying” a little extra winter so I think we’ll be set back a few weeks. Love the simplicity though; perfect weeknight meal! This sounds absolutely delicious and simple. With two little ones, supper time is often a work in progress throughout the day, or something that comes together quickly once my husband comes home from work. Not only is cooked spinach easier to disguise for picky family members (the husband in my case), but it’s actually more nutritious when cooked! Just don’t tell my Dan. I’m definitely digging the ease of this vegetarian dish – it looks so tasty I think even my meat loving Brian would dig right in. I’ve been getting bushels of spinach seconds from a neighboring farm. Lots is getting blanched to freeze for later quiches and green smoothies, but I have a large bag in the fridge waiting to be turned into….this, oh yes. I love a good one pot meal like this, especially when it involves spinach and ricotta together! Spinach is actually one of the most healthiest vegetables and perfect for kids.. One example of that is the Popeye the Sailor Man.. We can have it as an example for the kids so they are still interested to eat this recipe..
Oh my gosh… This looks SO delicious. I have to admit, I decided to leave spinach out of my garden this year and I’m starting to regret not buying seeds. Really, it’s not too late, so I’m thinking I should pick some up tomorrow and get them started! This was so delicious! Thank you, thank you, thank you. You were right, this recipe lends very well to add-ins. I made several changes and additions and it was a huge hit. Thank you!! 2 cloves minced garlic, 3 tablespoons-ish chicken broth, swapped the shallots for 1/2 leek which I chopped up, added 1 diced (chopped?) Portabello mushroom cap just before I finished the spinach, did the egg AND the cream (I couldn’t resist), and then tossed in some leftover roasted turkey. It was just as good today for lunch. And I will be eating it for dinner too. Honestly, Aimee, this was one of the most raved about meals I’ve ever made. And I am completely shocked my kids ate it, especially with the mushrooms. What a great recipe! Thank you! Delish! SO happy you liked it! Keep it in the repertoire all summer long and just keep changing up the seasonal vegetables…. 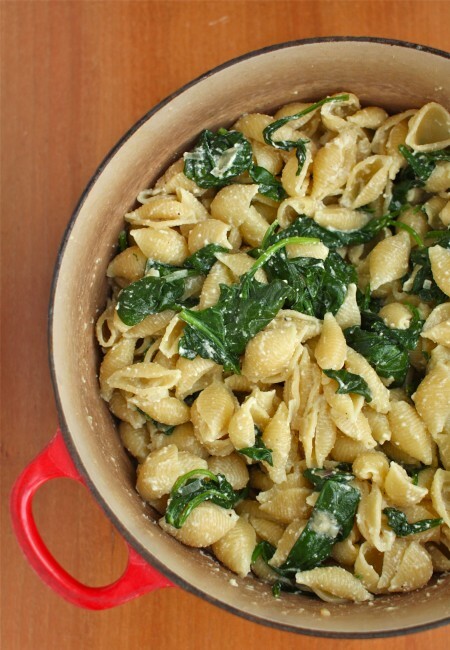 I love one dish meals and of course anything with spinach and or pasta. Are you saying I still have time to plant spinach? I have my garden boxes ready. I just bought my seeds today! You still have time. Glad you liked it, Gamoon. I’ll definitely think about your suggestion…thanks for the input. So excited to try this tomorrow night, but what I was most excited about was the name of your daughter! My little Clara is 8 now. Such precious times!!! God Bless!! This is a beautiful recepe. I follow it extacly and was plesantly surprised. My husband really enjoyed it as well. Good job! This recipe was great!! I also added some white beans for more protein. It was delicious! This was awesome! Added some chopped garlic, mushrooms and pasta water. Definitely a keeper. Husband said best pasta meal he had in a long time. This recipe was amazingly delicious, my whole family loved it! I used cream instead of raw egg (not because I am opposed to raw egg, but because I LOVE cream!) I shared this recipe in a recent meal plan on my blog rainbowdelicious.com. I will definitely keep following your blog and look forward to trying more of your great looking recipes, thanks! This may be completely stupid but I am confused; do we return the pasta, spinach, ricotta and egg into a hot pot and cook it all together after the pasta is drained? I really liked this recipe. A great meatless meal, which is something I’m trying to do more of lately. I added beans as another commenter suggested. Made this for the co-workers today…..it was gone BEFORE lunch!!! LOL! The only change I made was putting shredded Parmesan cheese on top-perfecto!!! Love this recipe – I’m excited for it and am hoping my family will feel the same… I may try it as a side dish to test it out first. Yum!!! So so good. I added the sauteed mushrooms. I will try this again and perhaps add some prosciutto? But it ‘s great meatless…. I cannot express how much my family lOVES this recipe. The fresh spinach with fresh ricotta!